A $10,000 donation from the Morris-Baker Community Fund will support ongoing work to rehabilitate Langston High School. Preston McKee, president of Morris-Baker Funeral Home, announced the gift during a press conference today held at the Johnson City Municipal Building. McKee said the donation is intended to bring a once vibrant community resource back to life. It’s also a way to honor the long-time friendship between his grandfather, the late Carson Baker, Jr. who owned Morris-Baker Funeral Home, and J. Fletcher Birchette III, the president of Birchette Mortuary. Birchette, a 1962 Langston graduate, passed away in August 2017. Langston served the African-American community in Johnson City from 1893 until 1965 when the school closed following integration. LEAD is working to transform what remains of the school into a multi-cultural arts and education center for all ages. 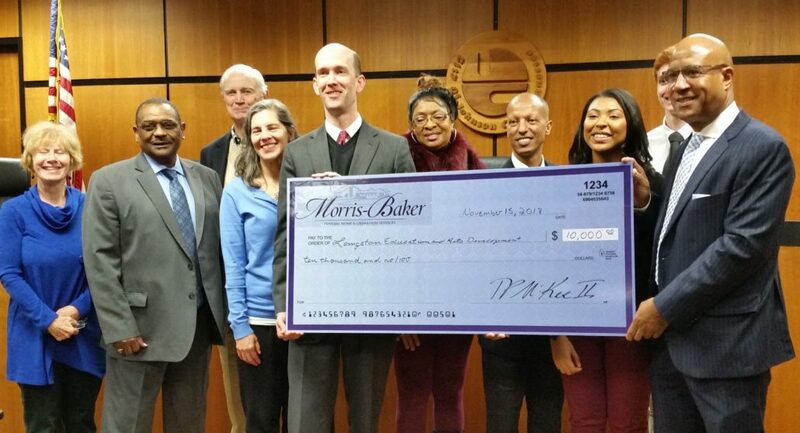 The Morris-Baker Community Fund donation brings the campaign a step closer to reaching the goal of $500,000. “I am humbled that Mr. McKee would choose to honor his grandfather’s friendship with my father. My own family – and the larger Langston High family – are especially grateful that he chose to remember Fletcher Birchette in such a generous way,” said John F. Birchette IV, the current president of Birchette Mortuary who serves as treasurer on the LEAD executive board of directors. “My father loved Langston and was the living embodiment of the school’s motto: ‘Enter to Learn, Depart to Serve.’ He spent his life quietly helping improve the community around him, and he would be so pleased to see the widespread support offered to this project,” Birchette said. The effort to renovate Langston High School is a public-private partnership between the City of Johnson City and LEAD. Last summer, the city allocated $1.8 million to fund the project. LEAD is working to raise the remaining $500,000 needed to completely fund the rehab project. Well over half that amount has been raised in grant funding, corporate contributions and private donations. At the project’s completion, the school’s gymnasium and shop will be transformed into a multicultural, multigenerational education center focused on STEAM education and mentorship programs. The space will also be used for special events, such as performances and professional networking socials, bringing together people of diverse backgrounds. “This project is more than bricks and mortar. It’s an opportunity in our community to bring people together,” said Johnson City Vice Mayor Jenny Brock who spoke at the press conference. “We are stronger when all the voices in the community are gathered around the table,” she said.